With the power gone, the dinosaurs began to escape from their pens and kill people. 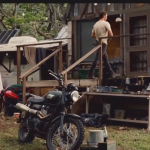 On his way to the East Dock to meet Dodgson’s contact with the merchandise in tow, Nedry took a wrong turn and inadvertently wrecked his gas powered jeep. While struggling with the winch to pull the vehicle back onto the road, he encountered a curious, seemingly harmless Dilophosaurus. Much to Nedry’s surprise, the dinosaur quickly turned vicious, spitting its venom into his eyes and blinding him. 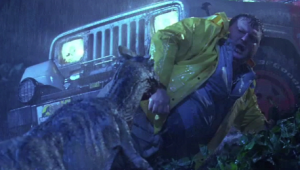 Nedry scrambled back to the jeep to escape, accidentally losing the embryos in the process, which rolled to the bottom of the hill. At first thinking he was safe, Nedry soon found that the dilophosaur was already in the jeep waiting for him. As the dilophosaur killed and began to eat him, the embryos came to rest under a ledge where they were buried in the mud. Shortly thereafter, Nedry’s body was discovered by Miles Chadwick and Nima. 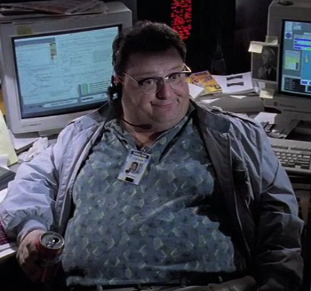 Various items have been noted at Nedry’s work station, among them a Panic Pete stress toy, a can of JOLT! cola, a wind-up swamp monster, and a picture of Robert Oppenheimer on the side of one computer screen. His computer station included a Quadra 700 system and an SGI Crimson system. Dennis T. Nedry was played by Wayne Knight.